Though time telling has always been a matter of interest to all people, wristwatches have gained more of an esthetic value than a functional one. Nowadays very few people wear watches as most people use their cellphones to tell time. The few people who still wear wrist watches put a lot of emphasis on the value of the watches. However, it is important to know that wristwatches were among the most important discoveries in the history of the world. If you are curious about the wristwatch history we invite you to read the following lines, as we will attempt to uncover the secrets of this particular accessory. The watches were created based on the 15th century spring clocks. When they first appeared, at the beginning of the 17th century, they were worn around the neck or attached to the clothes. Due to the fact that they were mainly worn by aristocrats, the watches were produced in small quantities and there was no interest in improving them. The minute hand didn’t appear until 1680. 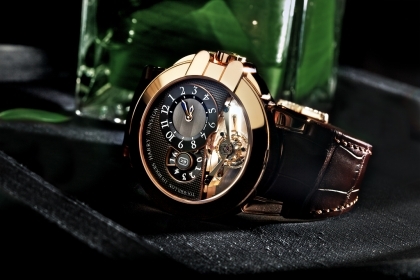 The wristwatch history experienced a slow yet steady development. In the 18th century, during the enlightenment period, the watches caught the attention of the academic community and they started to be viewed in a scientific way. As a result, the watch suffered several transformations and improvements and served as a foundation for other discoveries such as the marine chronometer, a device used for establishing the longitude of ships at sea. After a long time of people toying with the idea of a portable clock, the wristwatch finally made its debut in 1868. For a long time the wrist watch was considered a purely feminine accessory, while the men preferred to wear pocket watches. However the wristwatch history entered a new path during the first world war. It was during that critical time that men discovered the actual utility of the wristwatch. This was no longer a time for elegantly taking your watch out of the pocket in order to see if it was time for tea. It was a period in which time was essential, and being aware of it could often save one’s life. Although the wristwatches that the soldiers received during the war were very useful, they were nothing like the ones that we are familiar with. They were quite large and kept a lot of the features of pocket watches. Though the war changed the people’s perception on the watches, their evolution was still made in small steps. However, as society started to be more structured and disciplined, the importance of watches was once again recognized, and people focused on improving them. From this point onward, the watch’s evolution was strongly linked to mens and women’s jewelry fashion. Thought the esthetic value was highly important, especially since Cartier had got involved in the market in 1904, people also put a lot of emphasis on the accuracy of these instruments. 1949 was the year when actual progress was made, in regards to the watches’ accuracy, as the first atomic watch was created. Even nowadays atomic watches are still considered to be some of the most accurate wristwatches. In 1960, the first digital watch was created. Since then, the wristwatch history was written in a faster rhythm as the time instruments experienced a popularity explosion. Numerous improvements were made and several luxury brands devoted their activity to them. In women’s jewelry fashion, the digital watch is not as popular as it is in mens jewelry fashion, yet one must acknowledge the importance of the digital watch. However the last two decades have brought other technological discoveries which have made the wristwatch almost useless. Though many may believe that this is actually the end for these time instruments, we believe that the golden years are yet to come. Given the fact that technologies are focused towards flexibility and portability we are inclined to believe that we will soon witness new and improved wristwatches that will do a lot more than just tell time.